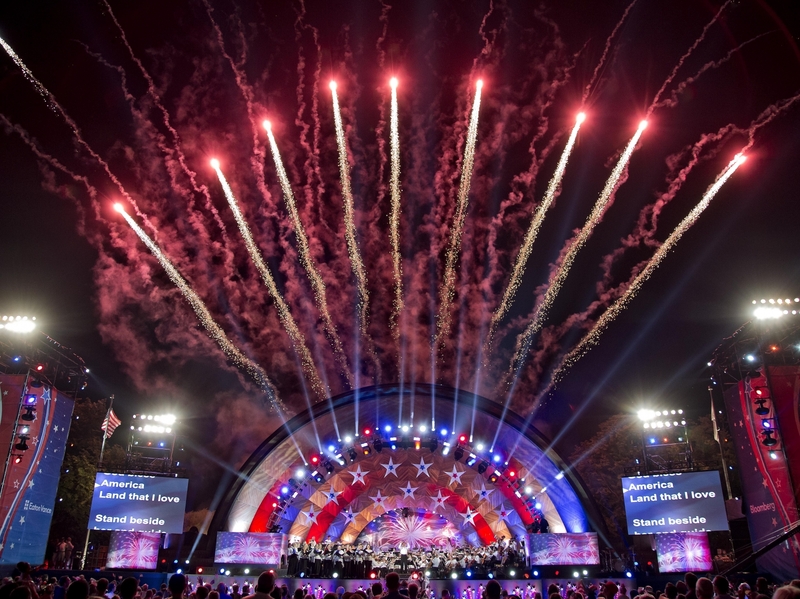 LD Mike Berger and 4Wall Light Annual Boston Pops Fireworks Spectacular | Press Center | 4Wall Entertainment, Inc.
Boston, MA- Hundreds of thousands gathered at the historic DCR Hatch Shell for the 40-plus year Boston 4th of July celebration, the Boston Pops Fireworks Spectacular. As per tradition, the fireworks, military flyover, and world-class orchestra led by Keith Lockhart returned for the ceremony, which typically brings around 400,000 people to the banks of the Charles River every year. For the third consecutive year Lighting Designer Mike Berger created a design for the celebration utilizing gear from 4Wall Entertainment. Over the years, Berger and his team have learned the unpredictability of the weather at this outdoor venue is something you cannot plan for. This year, Berger leaned heavily on pre-viz to get through the rain. "We more or less need to douse and power down the entire rig once we see bad weather and that pushes us into the pre-viz suite. This year we only had one overnight of darkness that we didn't get rained on before the show," said Berger. "The connected workflow between the grandMA2 and MA 3D made the jumps from inside to outside pretty seamless." With any show that repeats itself from year to year, the LD focuses a lot on learning from what has been done before while also finding places they can improve or enhance the product. "For this year's production, we tried a couple new treatments on the hatch shell and the scenic fascias," explained Berger. "I was really pleased with the addition of Chroma-Q Color Force II fixtures. Lighting Director Ryan Tanker really pushed these to the limit with his programming and they added a huge visual benefit to the show." The rig has been consistently the same for a few years. There are 6 scaffold towers which support much of the lighting, audio and video systems. A custom truss arch piece is added to the hatch shell that carries a substantial amount of gear as well. "Outside of the main performance area we have the 105mm Howitzers, the lighting of which has turned into a production in and of itself," said the LD. It's a lot of conventional lighting, but it requires complicated rigging to get all the lights in the right places within trees and even in the water. Lighting Director Chris Werner and Gaffer Eric Norris have become masters at finding homes for all of the gear over there." 4Wall provided 30 Vari*Lite VL4000 BeamWash fixtures which were the workhorses of the show. "One of the changes we made this year was to really try and tone the audience and surrounding area with color once we got into music," explained Berger. "These fixtures did a great job of providing the punch we needed and also seamlessly transitioning in and out of the various looks we put together." The GLP X4S's quality of light and small size lent itself to a variety of different applications. "For us, they mount perfectly to an existing piece of scenic pipe that allows orchestra backlight in a place where it previously didn't exist," said the LD. The Clay Paky Scenius Unico made a great first impression with Berger who was pleased with the fixture's brightness and effects package. 4Wall also provided a handful of GLP JDC1 fixtures which made its Boston Pops debut. "The power savings, added effects, and hybrid nature of the fixture made this a no-brainer to swap out from the traditional strobes we have had in the past," said Berger. "I really like how they can play a part in the overall visual composition of the rig, even when they aren't acting as strobes." This year MA Lighting also made its debut at the show with 4Wall providing two grandMA2 full-size consoles and two grandMA2 Light consoles. "The move to MA2 this year really helped speed along our programming process," explained Berger. "The show has a very truncated rehearsal process with absolutely no time on stage with the artists/orchestra before we get into our dress rehearsal." Incorporating MA 3D into their workflow made their process much more seamless as well. The team had 4 consoles all over the venue networked in. "Anytime one of us made a change in one desk, that would synchronize throughout the network and across all of our pre-viz computers," said the LD. "This really helped us be more efficient with our limited dark time and make our pre-viz time in the day much more useful and accurate." The Boston Pops Fireworks Spectacular was broadcast on the Bloomberg Television and streamed online for viewers across the United States to enjoy. Berger spoke highly of his team and the gear 4Wall provided. "I can't say enough about the team we have assembled for this show. Ryan, Chris, Eric, Jason, our entire local crew and the 4Wall team push the limits on a daily basis on what we are able to accomplish. We've come to expect a really high level of gear quality from 4Wall and this year, they did not disappoint."